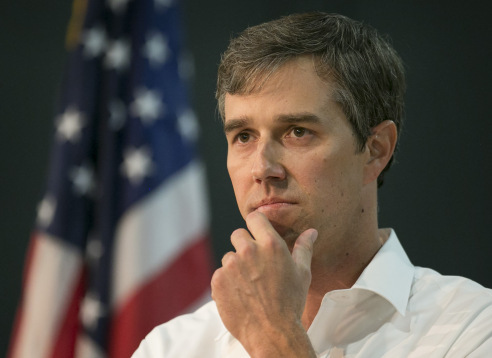 As the field of Democratic nominees for 2020 continues to grow, enthusiasm for the once wildly popular, Beto O’Rourke may be shrinking. Once the seemingly heir apparent to Obama’s youth and charismatic charm, O’Rourke saw firsthand what it’s like to be just another presidential candidate during a sleepy town hall event last week as the enthusiasm and star power he sought to generate hit a grounding snag in Iowa. The former Texas congressman, gave a stump speech to a sparse crowd of fewer than 120 students at the University of Iowa. Even though Beto arrived nearly 30 minutes late, the student union ballroom remained less than half filled as the candidate walked in to give his pitch to families and retirees before taking questions. Given the nature of the questions by the few in attendance, it seemed that many in the audience were far from committed to the presidential hopeful. A number of attendees remarked to the conservative leaning Washington Examiner that O’Rourke’s crowd was smaller than they anticipated, particularly in a city of 75,000 with a major university. The crowd was less than half the size of audiences drawn by O’Rourke’s rival, Sen. Bernie Sanders, at similar events in smaller towns. Some high school students appeared to have ulterior motives for being there. Julian Wallace, 18, was clad in O’Rourke garb but told the Examiner that he was only wearing it as proof for an extra-credit assignment. His friend Aaron, 17, seemed to be sizing up the competition for his preferred candidate, saying he thought O’Rourke lacked the “big ideas” of former tech executive Andrew Yang. Others in attendance said they were there just to hear the perspective of other candidates. One woman in the audience asked O’Rourke how he planned to define himself from all the others in the race. “We’re shopping, we’re open to other candidates. Wanted to see Beto in person,” a woman named Kelly, who was in the crowd with her husband, told the Examiner. O’Rourke’s campaign didn’t give a final tally, but the crowd appeared to be significantly smaller than those that fellow nomination-seeker Sanders garnered in other towns across eastern Iowa. Several hundred of people crammed into rooms filled to capacity to see the 77-year-old independent senator from Vermont. According to observers at the event, perhaps only as many as 150 at the most listened to O’Rourke speak in Iowa City. With candidates like South Bend Mayor Peter Buttigieg now leading O’Rourke in the polls, his youth no longer gives him an easy contrast with frontrunners — former Vice President Joe Biden or Senator Sanders. While O’Rourke stresses how he’s constantly learning on the campaign trail, many voters find Buttigieg’s thoughtful style more attractive. Despite an early rising star, recent surveys of Iowa voters place O’Rourke towards the bottom of declared Democratic candidates, at 5%, according to the Real Clear Politics average. Buttigieg currently leads O’Rourke in the state at 11%, according to a recent Emerson poll. Iowa will hold the first vote of the 2020 primaries.